While few know the third wife of Augustus or her importance in Roman History*, the concept of the ancient Roman gladiator is has remained in media for centuries. The phrase “Pollice Verso” or “With the thumb turned” is also a title of an 1872 painting depicting a defeated gladiator. Many may blame Russel Crowe and the historically inaccurate but extremely entertaining story of Maximus for this trend, I would argue that the reason why the gladiators are remembered is the same reason why Peyton Manning is a household name: we are, and have always been, obsessed with sporting events. 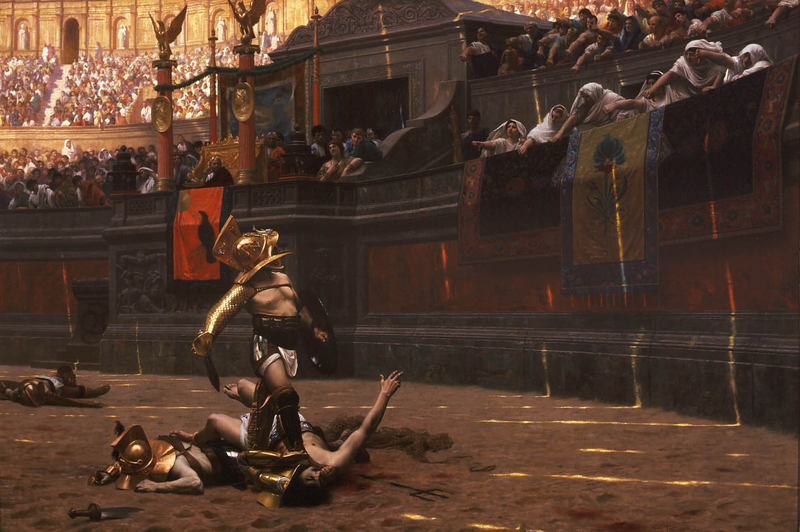 Despite this cultural trend, however, most people know surprisingly little about gladiatorial combat. According to the historian Livy, gladiators emerged during the third century BC. By the first century BC, these spectacles had become a staple in the public games, which were generally held in amphitheaters not unlike the Roman Colosseum (although that structure, completed under the emperor Titus in 80 AD was the largest free standing structure of its kind). While most of the gladiators were slaves, some free men became gladiators and trained in hope of receiving the fame and fortune associated with the sport. Good gladiators were much like today’s star professional athletes in that they had a great fan following and received many prizes. While a number of the more accomplished slaves were able to use proceeds from their successes to buy their freedom, many of these slaves continued to fight for this same reason. 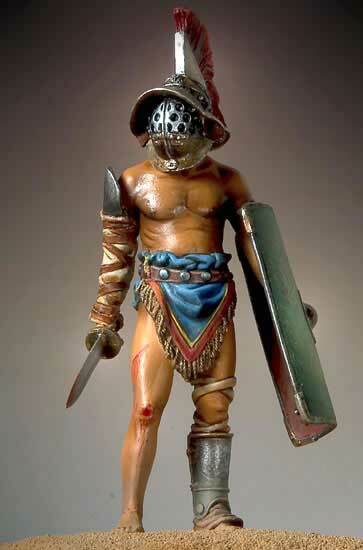 Once being enslaved, many gladiators attended schools where they learned to fight. There were many different classes of gladiators, but two of the more famous were the Secutor and the Retiarius. The Secuti, and the very similar Myrmillones (pictured, right), had helmets that made them look very much like fish. It was therefore fitting that the Secuti were made to fight the Retiarii whose bare top and heavy net made him appear to be a fisherman. One common misconception about gladiatorial matches was that death, both in these gladiator schools and in the amphitheater, was not as common as many think. If the losing gladiator fought well, it was not uncommon for him to be spared. Additionally, gladiators were expensive to house and train, and the politicians who payed for the spectacles used the opportunity to look forgiving. (But just to be clear, there was a lot of death at the expense of entertainment. If the gladiators did not satisfy one’s blood lust, there were also animal hunts generally featuring exotic species that had been imported from across the Mediterranean and beyond). Another misconception is that “thumbs down” definitely meant death, but, as with the ambiguous wording of Pollice Verso, there is some debate over which direction actually meant the end of a life. some who support the theory that the thumb was turned up assert that the thumb was actually pointing at the jugular vein in the neck. While I have previously mentioned the historical inaccuracy of the movie Gladiator, it did get one thing right. Many of the Roman Emperors, especially the ones who are today regarded as the craziest, did actually enjoy “competing” in gladiator fights. The worst of these emperors was the crazy megalomaniac Commodus, who fancied himself quite the macho man. He had himself depicted as the new Hercules in all of the prevailing art at the time, and was frequently inside the Colosseum, instead of on the side. As is to be expected, Commodus “won” every fight (there was historical precedent for such an event, as the Emperor Nero won a chariot race after being thrown out of his chariot very early on). Luckily for the Roman people, Commodus was strangled by his wrestling partner on December 31 of 192 AD, the day before he was to execute yet another gladiatorial masquerade to celebrate the New Year. *Augustus’s third wife Livia Drucilla was the mother of Augustus’s adoptive son and stepson Tiberius. According to some historical accounts, Livia was responsible for the deaths of all of the alternative heirs of Augustus so that Tiberius, who Livia thought she could control, would ascend to become the next emperor. The concept of dominating mother figure trying to control her emperor son would re-emerge a few decades later with with Livia’s great-granddaughter Agrippina the younger, the niece/ fourth wife of the Emperor Claudius. Agrippina poisoned Claudius (supposedly with mushrooms) so that her son, Nero, would become the fifth Roman emperor. Nero, who was to be the last emperor of the Julio-Claudian emperors, later had her killed. I am a huge Roman history fan. You should watch the TV show Spartacus. 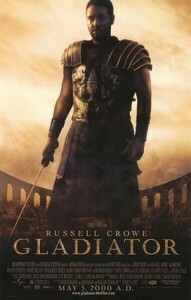 It’s all about the life of the gladiator and then his eventual revolt against the Roman Republic.